How sad that the "way it is" tonight is that Walter Cronkite is no longer with us. Even sadder that he didn't make it three more days so he could have appreciated just how much we appreciated him all over again as we talked about the 40th anniversary of the Apollo 11 moon landing and how he was our worldwide tour guide. ...I’m talking about the most personal news coverage ever seen during the Iraq war. For the first time, on a mass scale, reporters – many of them TV reporters – were embedded with combat units, travelling with the soldiers, facing the same dangers, and reporting back home, often in real time, over satellites. We lost some of our own, too, including NBC’s David Bloom. It was the immediacy of the TV pictures that made news by covering news. But there have been other brave reporters over the years, sending their coverage from the front lines to the home front, but none of them have been as distinguished through their careers in television as our next guest. 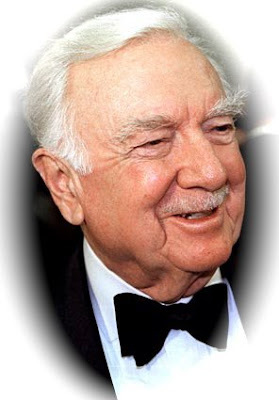 Ladies and gentlemen, please help me welcome one of America’s original embedded reporters going back to World War II – Mister Walter Cronkite! I'm still blown away that I got to make that introduction to so famous a man as Walter Cronkite. He was 86 years old that year, frail, and his voice faltered a bit from what it had been in its prime, but he walked out there strong, made his speech and every single person in the audience paid rapt attention. It was Walter Cronkite and he had earned that level of respect from everybody there. So we're sorry to see Walter go... He had a great life. He made ours better. He was so infinitely cool, even to the end.